You just proved my point. All the Bentley's at that dealership are BLACK or WHITE none of them are Bespoke. You get into a Bespoke Bentley with a 9K paint job in a color that people love and they hold their value. You can buy a black or white or silver base Bentley all day long for much or nothing because first they have trunk money in them because the 15's are out. But they take the first hit of depreciation on the first two years after that try and find one for less than 170-180k. You find a two year old MBZ and you can almost buy one for 1/2 price. Over all the Bentley has less deprecation. As for "Jerk factor", I have no idea what your talking about. They are not in the least overstated, so that being said most EVERYONE would disagree with you on that. The only thing that angers me with the English cars is that they only carry a 3 year unlimited mileage warranty but who cares about mileage. I haven't found one that had more than 20K miles in 8 years. Unless you drive one into the ground the mileage is a joke. They need length of warranty not miles. I bet when I ever get rid of my new one if it has 8k miles in 10 years that will be high. I find that if you look at the not so pretty first GEN of the Continental (04-07) they still sell for about 65-80K but they were only 140-150 new and that is 9 or 10 years old. Listen, I get what you are saying but in actuality they will not come down in price. A lot of the sellers will keep them until they find a buyer. Bentley buyers are a totally different breed than MBZ buyers. Your on a whole different level with a Bentley than a MBZ. It's like the difference between NM and BNY. NM is high end but BNY is a notch above NM. Bentley will always be classic and they don't look old with time because they don't keep changing drastically. That is where other automakers have troubles. Automakers other than RR and Bentley only care about the initial sale where RR and Bentley care about residual. So, let me tell you a tuned W-12 is like no other. I had both mine tuned to over 700 HP and they are amazingly sick fast but the V-12 tuned can out perform the Bentley, just not with the electronics. My next buy I think is going to be the 14-up Spur. Oh also notice the Sapphire blue cars sold for full on book where the Black, white and silvers are being heavily discounted and the V8's is being even more heavily discounted. Its the dealers own fault for buying those colors. People are sick or no color choices. The real buyers Bespoke their own Bentley and they pay full pop for them. No one wants a black convertible even in CA. are you kidding me and in white it looks like a bath tube, esp. the convertible. Last edited by 2014CL600; 11-27-2014 at 05:12 PM. I meant 'jerk factor' not factory. What I mean is a town like Austin here I live are a bunch of tree hugging Prius driving lovers. You pull up in a Bentley somewhere and leave it, it's most likely going to get keyed. That was the only point around that. A lot of anger for people with money. Bentley warranty I agree is a complete joke--4 years or even 5 should be standard and cap the mileage. 3 years--ha! Hyundai anyone. I won't disagree after year factor on depreciation. As for Bespoke, whatever. I personally like the black on black (or excuse me--beluga/beluga--which is the #1 selling color on a Bentley FYI). For me I want a sportier look and every car I buy is black. I'm in my 40's not 60's, so need something with a sports appeal--nothing looks better than black when clean and waxed. You can argue, but that is besides the point. White, yes looks like a bathtub. Anyways appreciate your feedback on the car, as I think it's a true all around (HP to die for, looks are ok, interior is spectacular and they are not on every street corner). I normally only keep my cars for 6 months, so a new '13 or '14 'executive demo' unit that has taken depreciation hit on Bentley is key. Also, comparing Bentley to MB is silly--one is a hand made car and one isn't. Last edited by texex91; 11-27-2014 at 05:15 PM. Think if I can get a 2013 for about $155k super low miles, the W12 would be the winner for sure. I hear you on black--but it's a personal thing. Not hard to read at all, unless you need glasses. Yes, the 13 for 155k is a deal but I am sure it has to be a base, not Bespoke, no door wood inserts or full wood wheel or the special wheels, or Mulliner upgrades and in black. I apologize, I didn't mean to offend about black cars, I just find them boring and lacing in imaginative (IMO). That is why black is free and colors cost 8K on a Bentley. You get out of the base and into a Bespoke with options and then your back up to 170-180. Keep your eye on all the sites. They aren't selling for less than 160K for a base. I look every single day but the point we were making was for the same money as the new S Coupe with much less content except for innovations, I think the Bentley is the way to go. Buy the 155K you will be more than happy you did. Plus it will be worth more money in the long run, esp. if you plan on trading. Last edited by 2014CL600; 11-27-2014 at 05:55 PM. Yes, it's a W12 Speed, 21" 10 spoke, red calipers, carbon fiber (which again I like sporty, so you would hate it), yes Mulliner, so again not Bespoke which suits me fine. Hey, it's not the V8 at least. Last edited by texex91; 11-27-2014 at 06:00 PM. I looked on every website for the car your talking about and NOTHING under 180K. There is a 13 Black base with red sticking NO extras is being bid on and is at 153,500.00 hasn't met reserve but I can assure you it wont sell for less than 180 plus. Last edited by 2014CL600; 11-27-2014 at 06:22 PM. Not hard to read at all, unless you need glasses. paragraphs my man, use them. also, while your individual sentences make sense, they are seemingly thrown at the page at random, making it difficult to understand. anyway, the s coupe is a better car than the bentley, but the bentley has and will remain more opulent. that leather headliner is the dogs *****. Quadcammer I don't want to be rude, so I wont. I will say, you do not know your hole from deep center field. If you think the S Coupe is better, then you really don't know what your talking about. I am an MBZ man through and through but your comments are unfounded and totally unrealistic and not based of actual facts. The interior of the new S Coupe compared to the Bentley are in two different leagues. 17 Bull hides make up one interior of a Bentley and ALL of the wood is book book matched and the car is hand built. The new S Coupe is a production car now no more hand made MBZ's any longer. That went out with the CL. That is what the bean counters have done with the finest car company in the world. Shot it straight to hell and it upsets me just as much as anyone else. Your getting far less for way to much money. Sorry, the facts are the facts. The only thing that is hand built now are the Engines on the 65's and possibly the 63's but that is it. No more ABC suspensions (except on the S 600). The days or wine and roses are gone. The pedals have fallen of the rose. Mercedes will continue to sell to the masses but they aren't the car that Bentley or RR are. They almost were but not any longer. It makes me sad to admit it but the deprecation charts don't lie. It takes 6 months to build a Bentley. It used to take twice as long to build the CL than any other Mercedes but now they are all on true production assembly lines. No more high end, just high price. That is why I won't buy another MBZ ever again. Last edited by 2014CL600; 11-28-2014 at 02:30 AM. I think with today's automobiles, with state-of-the-art robotic production lines, "hand-built" may be *more* prone to manufacturing defects. 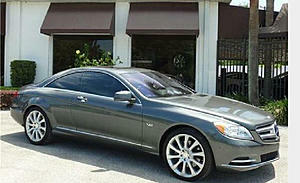 I think considering the economy of scale, the Mercedes S Coupe gives you more for the money than the boutique brands. Also, a large Mercedes national service network gives one peace of mind. I've read many reviews of the S550 Coupe, and all *praise* the quality of the interior, and compare it favorably to Bentley, etc (please don't tell me these reviewers have been "paid-off"). The interior of the bentley is nicer, albeit more traditional. Thats pretty much where the advantage ends. The s-coupe rides better, performs as well with far less power, stops better, handles better, and in my opinion, has better assembly quality. Yes, there are chintzy pieces here and there which is not really the case with the bentley. I stand by my statement. The bentley is more opulent and has a nicer interior. The benz is the better car. Are you serious? 6 Months to build a Bentley Continental? A CL twice as long as any other Mercedes? You are living in a grand delusion and in the past. The S Coupe is beating the Bentley in every contest I've seen so far. Yes the Bentley has more hand built in its makeup, but its an antique and it is based on a 10 year old VW chassis. I do have to say the press is loving the Coupe. Almost every article is positive such as Car and Driver "Combine that with a cabin easily a match for anything from Bentley and exterior styling slicker than anything else Mercedes-Benz sells, and you've got the most desirable GT car on the planet." "No longer should your Bentley-driving golf-club buddies confusing your six-figure Mercedes for a $30,000 front-driver. Keen to reaffirm the connection between its flagship grand-touring two-door and the S-class sedan that sired that car, Mercedes has canned the coupe's old badge. The CL is now known as the S-class coupe." Last edited by texex91; 11-28-2014 at 01:37 PM. Yes, if you know Mercedes and obviously you arenot familiar with the CL as you drive an old S 500 sedan (which is a production car) The Cl is built on a much slower assembly system and is hand built and not a production car like the others. Why do you think they only build 2000 per year? As for being in the same class, not even a ****** chance in church. I own both and they don't compare. Do not believe everything you read. The car isn't 100 more because it is a just because. There are reasons. If you think its a 10 year old chassis your right but the entire car was completely redesigned and engineered in 2012. Listen I love my 2014 CL 600. It is more fun to drive, easier to handle, just as fast but I do not have the accoutrements that I have in the Bentley. The S Coupe is just new. The interior seating in the Designo is amazing but the car lack everywhere else. The door panels look cheap with that brushed aluminum and very little wood. The interior dash and door panels should have been the S sedan. Its just a cheap looking interior with a lot of gadgets. The car looks plastic all the way around. Great styling, fresh, new innovative but still. You cant dress up something to be what it is not and Bentley it is not. Next year there will be something even grander in the eyes of the press. Drive a new CL 600 and then drive a brand new S 550. They are worlds apart. Now the 65 might be in a whole other league but the dash and door panels need attention to detail. Over all the execution isn't great. Go drive a GT and then tell me which car you would rather own. Two different worlds. I love MZ but this car is a disappointment and the Sedan is an even bigger one. RR Phantom is an ugly Rolls but the Ghost is beautiful. Why is that, because time takes care of things just like the 07-10 CL were so ugly and the market shows that in resale and actual sales to be exact. With improvements the 11-14 became a beautiful car. Trust me in a few years when the refresh both the S Class's they will get it right but until then the consumer will have to suffer and buy what they shove down peoples throats. They did a better job on the design of the C Class over the S and you cant tell them apart but the proportions are much better on the C than the S Sedan. You like what you like and that is fine but sales will tell the final tale and resale will tell you. Keep up with how they do over time. PS I didn't have time to re-read, I have to leave now. You are just wrong. Did it ever occur to you that they only build 2000 a year because that is all they can sell? The CL has not sold well since it was introduced in 2007. Then it sold 3-4K a year in the U.S. it dropped every since. You are seriously wrong and mistaken if you think that the old CL was some special hand built product, that is simply not true. Me having a W140 has ZERO to do with what I know about Mercedes. Just because you own one doesn't mean you know more about the car as far as how it is built. Are you kidding me? The CL was built on the same assembly line as the S sedan and the only reason output was limited is because they didn't sell that well after 2009. The CL was a production car just like anything else. You have NO clue what you're talking about man, sorry. The only truly hand built product MB made was the previous Maybachs, the 57 and the 62. Those were built on a separate line and built at a much slower rate. The CL wasn't built in large numbers because it didn't sell. You're confused as to what true exclusivity is. Exclusivity isn't low production because of slow sales. Exclusivity is what Ferrari has, orders for more more cars, but they cap production at a 7K a year to keep it that way. The CL sits for months at the dealerships and hardly anyone bought them after 2010. You're deluded on this man. Why is that, because time takes care of things just like the 07-10 CL were so ugly and the market shows that in resale and actual sales to be exact. With improvements the 11-14 became a beautiful car. Seems to me that the CL did just fine for the first 2 years and then tanked (market crashed for luxury cars). You are very naive if you think Mercedes couldn't have built 10K of these if they wanted to. NO Mercedes is a handmade product in the way that a Bentley or Rolls is, hasn't been that way in years. The last MB with that kind of attention to detail was the W124 E500 which was handbuilt in cooperation with Porsche. Seems to me the market didn't want the CL after 2010, right at the time you say it got "beautiful" though it was the exact same car with a facelift. Going by your sales theory the 2007-2008 CL was the best one. Last edited by Germancar1; 11-28-2014 at 03:07 PM. Prices reflect sales. You obviously do no know what your talking about. Speak with MBZ corporate. The CL is built on a separate assembly line and YES, it is not a production car, like the S. Check your facts. That started in 2000 with the new CL and continued until this last year. So, yes. I do know what I am talking about. I am not going to argue with you about this because we are on separate pages when it comes to knowledge and I will not argue with a know it all, who "Thinks" he is right.. If you weed out the lame 550 and glorified 63 and factor in the 600 and 65 those numbers drop into to the hundreds. Only about 200, 600 and 65's were produced in total from 11-14 and the sales jumped with the new face lift in Nov of 10. We all know that the 14 was the least produced because everyone knew the new model was coming. So, your logic makes no sense. The prices jumped and that market has always been driven by wealth. MBZ for the 11-14 run, would not allow any 600 or 65 to be produced without a customers name attached to the order. It was in fact a way to keep the dealers from just keeping them on the lot for sale. They wanted to make them more exclusive, which drove down the numbers. The increase in sales for any new model is high the first year and the refresh year, then the numbers drop off, as will the new S Coupe as has the S sedan. I can assure you that if you bought one used you wouldn't be able to fix anything on it. My Bentley when out of warranty by 3 months (which is a 3 year unlimited miles **** warranty), cost me 15K the first run out of the gate. That is why I got rid of that model. NEVER own any of these cars out of warranty, unless you plan on not eating. If you have to drive a 10 year old Mercedes you cant afford a new on. I am not saying your S 500 isn't one of the most beautiful one they ever built (because they were) but if you have the ABC suspension, it will cost you an arm and a leg to have fixed. I know for a fact because I had a 06 CL 600, that I bought as a second car with 10k miles and I spent over 8K just on the suspension alone. I am not bothered by the expense to fix but most people are. Check your facts before you spout off something you do not know what you are talking about. End of conversation! Last edited by 2014CL600; 11-28-2014 at 06:08 PM. Nah it's more like you know what I just posted, blows away that nonsense you're talking about. Price reflect sales? Really so you think a few grand increase over time cut sales that much on a car that over 100K to begin with? Now who doesn't know what they're talking about? The CL could have been built on a different line, but it was a production car and the only reason why Mercedes didn't build more over the years is because they couldn't sell any more of them. The CL600 and CL65 AMG didn't sell! Honestly, you don't get this? It isn't like Mercedes had orders for them and decided not to build them. The 2014 model year? Right, none produced because of the new car, but what about 2011, 2012 and 2013? Do you know why it didn't sell well those years? Sorry man you're lost in the land of make believe and you haven't a single clue of fact as to what you're talking about. To further prove you don't have a clue, the S and CL are the same exact car underneath, the difference being the body. Why on earth would Mercedes hand build the CL like a Bentley when the S produced like every other car? Makes no sense at all. Same interior, same engines, same everything except some trim pieces and you think Mercedes handmade ever CL? LOL hilariously wrong lol. You're obviously confused between what handmade is vs being made on an assembly line. The CL was a production car like every other Mercedes and the only reason they didn't build more is because they couldn't sell any more of them. The CL sits at dealers for months, ask any salesperson here. Last edited by Germancar1; 11-28-2014 at 06:18 PM. CL's were very difficult to sell with horrific resale values. That's why production was so low. Like I said you have No clue, you won a 10 year old car so I'm talking to someone who doesn't know what they are talking about and I live in Beverly Hills, cars DO NOT SIT here. They sell on average within 30 days of transport to the dealer. Yes, Mine in a 2014 CL 600. It took me MONTHS to find this one and I refused to buy BLACK. When this one came along it was a NO brainer. I figured, if I don't buy it and I do not like the new S Coupe ,then I would S.O.L and good thing I bought it because the new one is JUNK. I don't care if everyone in the world loves it. Unless you have driven a 600 series you will NEVER get what I am talking about. So, again. End of conversation. You have NO idea what your are talking about and I will not answer you back. PERIOD, Good day. OH BTW, The guy that originally asked the question is going to buy a Bentley instead. He is a wise man, not a fool. I also see you have put in some new cars that you didn't have before, I am so not impressed. I spend more money in a month than you will make in a year. Stop trying to posture and be a know it all because it falls on deaf ears. Yes, Most people cant afford a 600 or a 65. If you look at the 63, which is what MBZ is trying to push for government fuel ratings, they have the least amount of residual value of all of them. Go on Auto Trader, Cars.com, Guru. You can find more black, white and silver 550's and 63's than you can shake a stick at. Try and find a 600 or 65 from 11 up. I did find one 65, S class for 11 but it had way to many miles (55K miles to be exact). Amazing car but to many miles for a collector car. Jakes has a 12 CL 600 but its Silver and Keys has ONE 14 CL 600 and its BLACK and not Designo. If you want a 2010 back you can find anything you want all day long as long as you like black, white or silver. Also factor in geography into play because if your buying a used model you want one from an area that doesn't use salt. Most cars that are desired are from Southern California. Needless to say, if you can find one that isn't one of the three shades mentioned they sell very fast. I lost one that was on Autotrader for a week and they had sold it within 3 days. Designo Red, gone before I had a chance to buy it and it only had 5k miles. They wanted 7K over book but I was to late. Made me sick. That was the car I had ordered and it slipped from my fingertips. Mercedes isn't pushing the 63 for fuel ratings. The fuel economy on a 63 engine does nothing to help in this area. Mercedes would be much happier selling more 600's and 65's as they're higher margin cars. The residual on 63's are lousy but not nearly as bad as the residuals on 600's and 65's. If you go into KBB and price an 11-14 CL 600 vs an 11-14 63's see which one is worth the most money. As for the 550 and 63's they were able to do away with the gas guzzler taxes because of the direct injection offered for those years. That is a fact, check it out. As for taking a bath on my 600, I could careless. The car is AMAZING and I have owned six 600's since 2000. I must admit the 00-02 were the best engine but after 03 the car came alive. I still have my 06 CL 600 with 4,300 miles stored away. I love it and take it out every now and then for some air. It has had some issues but the last one ( while to new to tell) has had zero issues and this is the first EVER in a Benz for me. Last edited by 2014CL600; 11-28-2014 at 07:27 PM.